At Skelton Slusher Barnhill Watkins Wells PLLC, our attorneys combine more than 70 years of experience in civil litigation and transactional law. They possess a comprehensive legal background, track record of success and an unwavering commitment to resolve complex problems for East Texas residents. Many members of our team are Board Certified by the Texas Board of Legal Specialization. Scott Skelton, Board Certified in Personal Injury Trial Law, and Brent Watkins are experienced trial lawyers who make up a strong litigation team at Skelton Slusher Barnhill Watkins Wells PLLC. Those important designations provide them with much-needed insight into the tendencies and subtle differences of juries in counties throughout Texas. Aimee Slusher is Board Certified in Estate Planning and Probate Law. Jeff "Marty" Barnhill and Judi Wells, Board Certified in Oil and Gas Law, oversee our transactional process. 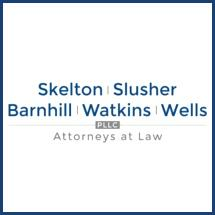 Simply stated, the attorneys at Skelton Slusher Barnhill Watkins Wells PLLC provide a higher-level advocacy for our clients in Lufkin and throughout the Lone Star State.